Last Friday, I finished my first full week at the CSA (Community Sustainable Agriculture) gardening farm where I’m currently working. Wow, must I say I have learned so much already! For one, I don’t think I want to open up my own CSA like I had once dreamed. While I say this half jokingly, I also say it half seriously. Working on the farm is a lot, a lot of hard work. I’ve grown up working in my family’s organic garden, which is much larger than your average household garden. I’m used to sweating out in the sun doing doing hard labor for hours at a time, and my dad has instilled an appreciation for hard work within me since I was little. I wasn’t initially sure how large-scale the CSA garden I’d be working at would be, but I now know that my household farm is nothing in comparison to the CSA, nor is the work I had done in my family’s couple-acre garden. Sure I’d plant 40 or so tomato plants in my family’s garden, more than would be planted in the typical family plot, but at the CSA I was planting 400 tomato plants just within the first morning on the job. On my second day of work, I had planted a total 1,000 melon and pepper plants…1,000 plants in one day! My back was definitely yelling at me by the end of that day. While working on the CSA farm is certainly tiring, I want to emphasize that it’s so very rewarding, particularly compared to most typical summer jobs I could have gotten. On my drive home at the end of that second day, I reflected on what I had just accomplished and realized I had just planted the most plants in one day that I have ever planted in my entire life. Sure I was exhausted, but it was a satisfying exhaustion. 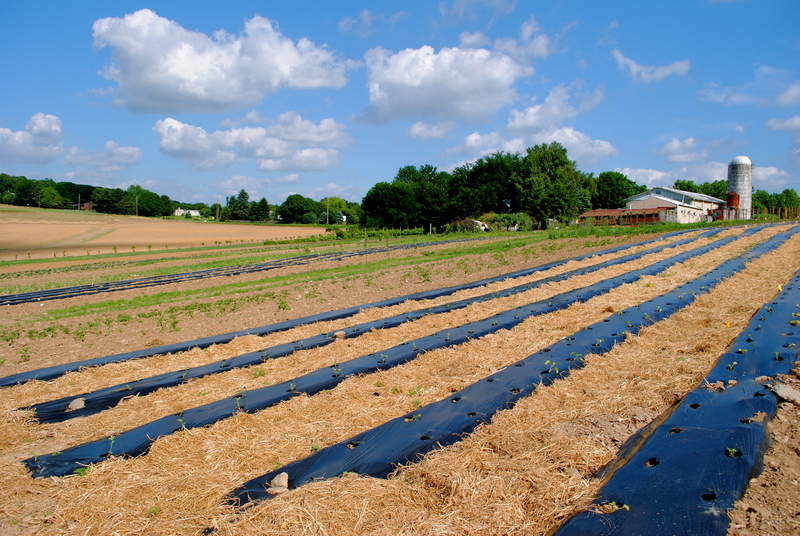 On my first day, I had learned that while I was planting 400 or so various tomato plants in a small section of the field, there would be nearly 100 varieties of heirloom tomatoes being cultivated that year at the CSA. I really support the heirloom movement, and I was proud to be a part of such an impressive tomato-growing CSA! As I paint my hands in mud day in and day out, I’m picking up so much information and useful tidbits along the way that hopefully I’ll be able to carry with me through time. Even if I don’t open my own CSA one day, I’ll certainly always grow a garden (at least I hope). I’ve learned that growing plants inside black plastic helps hold the water and attract the sun and can enable plants to grow twice as efficiently. I’ve learned that blueberry bushes love dirt from the woods because it’s more acidic, and that they also really enjoy being fertilized with pine needles. I’ve learned that my little muscles are surprisingly strong, and I can hoe through large fields of compact dirt and shovel wood chips for an 8-hour work day. I’ve also learned and re-emphasized my thoughts that you certainly don’t need a gym to feel sore the next day. (Boy were my shoulders and arms feeling all that shoveling the next day! After a little over just one week, I’m already feeling fully immersed in farm life. Dirt permanently beneath my nails. Skin almost as tan as the dirt. Body always a little tired or sore in one area. Appetite, pretty ravenous. Bed time, much earlier than a college kid is used to. That goes the same for my morning wake-up call. A daily 15 minutes of yoga a huge plus in the morning or evening. I can’t lie, my summer job is more back-breaking work than I’m used to and it’s already taken a little adjusting. But I already know that this job is going to be (and already is) such a great and worthwhile experience. Plus, a job where I get to be outside almost all day is my kind of job. A little sweat and dirt certainly won’t harm me. I also want to add that the family I’m working with is so great…I know I’m definitely going to be one of the fam. by the end of my summer job. So far it’s just a husband, wife, their son, and me working on the farm, and a little old grandma who’s always sweetly there to talk and give encouragement. 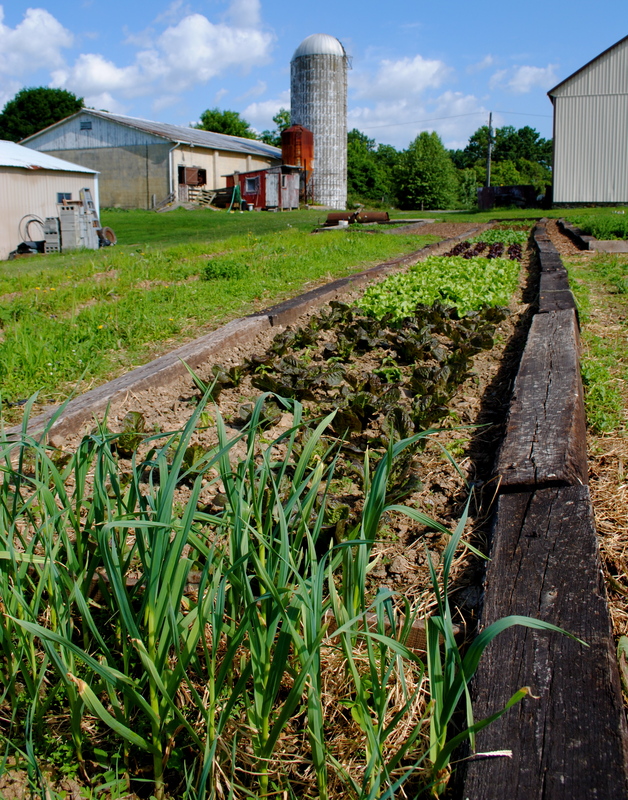 At the end of this week we’ll begin to prepare for the first CSA run and farmer’s market! I can’t wait to learn about this side of the farm, for this is something I really don’t have much previous experience with. I though I’d leave you with a short log of my first days at the CSA…below you’ll see the kind of hard work you’d be getting yourself into if you worked/ran a CSA…but certainly rewarding as well, especially when all those plants start to birth veggies and fruit! Thursday (1/2 day of work…of course my car battery would die on my first day! ): Planted 400 or so tomato plants. Weeded a 100 x 10 foot area of lettuce with a hoe. Weeded the herb garden. Became acquainted with the farm. Friday: Planted 400+ sweet and hot pepper plants. Planted 600+ cantaloupe and watermelon plants. Some small hand weeding. Monday: Hand weeded and then hoe weeded one of the blueberry patches, approx. one 200 foot row. Then spread long pine needles up and down the row and in between the blueberry bushes. Hoe weeded the lettuce again. Hand weeded the rhubarb. Planted some flowers all around the house. Left around 2 or 2:30 due to rain…went home and baked a rhubarb crisp! Wednesday: Hand weeded and then hoe weeded several 400 foot rows of swiss chard and spinach. Planted 100 or so okra plants. Used a hoe to remove grass and weeds between 100 blueberry bushes spread 10 feet apart…approx. 1,000 square foot area. Fertilized 100 blueberry bushes by hand. Help spread sawdust around blueberry bushes. Friday: Weeded a gigantic flower garden, probably around 1500 square feet. Used a wheel barrow to dig mulch and spread around entire flower garden. Did some odds and ends jobs, such as painting a couple tables and areas around the house. 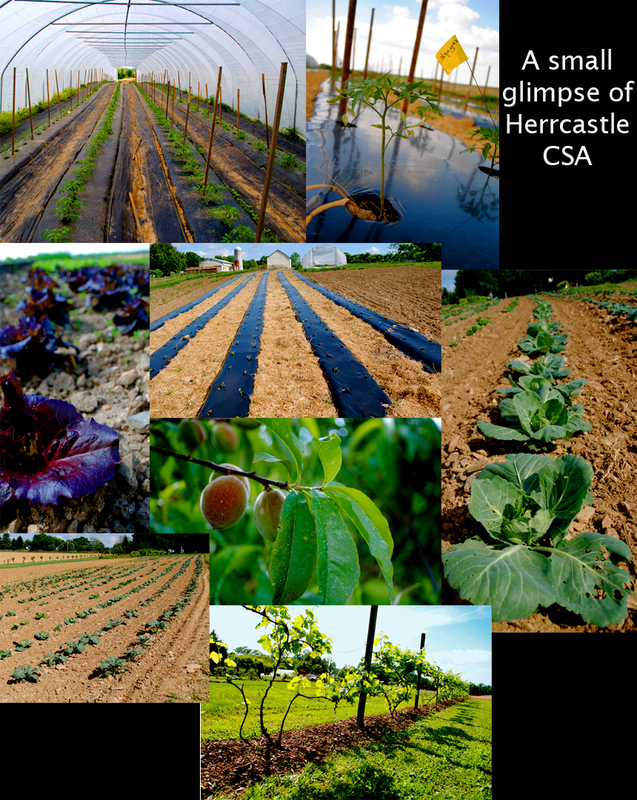 If you live in the Lancaster or Philadelphia area, check out Herrcastle Farm. They also do farmer’s markets around the Philadelphia area. That sounds like a such a wonderful experience…but some real HARD work too! That sounds like such a great experience. I imagine it requires long days and lots of work, but talk about rewarding! Wow, what an awesome experience. Thanks for sharing. I know you will have updates for us throughout the summer. I can’t wait to read more about this. This is no joke..some serious hard work, but it really seems so rewarding. Wow you’re a busy lady! Tilling up soil with the hoe is a great work out. I miss doing it from when I had a big vegetable garden. Glad you’re enjoying the outdoor work! I started in college with a personal vegetable garden and was sucked into it all, and became a professional gardener. I know of the aches, mud, and early bed times you speak of. Rewarding work, for sure. What a job…that is WORK! 1,000 plants in a day!? 400 varieties of heirlooms!? This is one SERIOUS CSA!! I love it! I would be tan and buff in no time doing that type of labor…wow! Good for you! What an AMAZING experience!! I guess it’s a good thing you get to do this before trying to start your own, right? You may change your mind later in life, and decided you really DO want to start your own/run your own CSA, but it’s good that you really get to make a sound decision based on experience. It does sound very fun, but it does also sound like a lot of hard work. Nick and I are doing our garden and it’s been VERY tough, and rather than 300 tomatoes, we’re planting about 20…..so I can only imagine how difficult this is!!! Wow, what great insight! Like the tidbit about the black plastic bag to trap water and attract the sun. Look forward to reading more about your job at the CSA. Officially jealous Grace. This is awesome!! I don’t even think you realize what this will do for your future, and what other opportunities might come out of this! Soo cool. 🙂 Great pictures too. It’s Annie from outdoor club, Temple, etc. This sounds like a great experience and I would love to talk with you about it more when you’re back in Philly in the fall! I’m working on an urban low-income CSA in Philadelphia this summer and it would be awesome to hear about the operations and obstacles of an established rural CSA.